“Somewhere, something incredible is waiting to be known,” wrote Dr. Carl Sagan, American astronomer, scientist, author, and self-proclaimed atheist, regarding our universe. He was closer to the truth than he could know then! In 1977, when the Voyager 1 space probe made its journey toward the outer reaches of our solar system, Dr. Carl Sagan and other scientists prompted NASA to turn the probe’s camera around, so it could photograph what it was leaving behind. Witnessing our vast star system and planet Earth fading into the distance, Dr. Sagan would write a book titled Pale Blue Dot: A Vision of the Human Future in Space, believing Earth to be only a mere “pixel” in the universe. Having survived the WW2 Holocaust and three concentration camps, Corrie ten Boom—a Dutch watchmaker who, along with her family, was arrested for hiding hundreds of Jews from the Nazis—spent the next four decades of her life telling thousands about her experiences. Mainly, she shared about her faith in God, and the miracles that helped her and others during that dark time. “Faith sees the invisible, believes the unbelievable, and receives the impossible,” she said. “There is no pit so deep that God’s love is not deeper still.” Hers was a message of hope and assurance. Even amid the dark horrors of the prison camps, Corrie was able to tell others, “In darkness God’s truth shines most clear.” Surely, that would also be true in the darkest reaches of space! Sadly, the wisdom of scripture is more and more ignored in our world. Yet, it forewarned about these times we live in, “Because lawlessness will abound, the love of many will grow cold.” Corrie experienced those places where the coldest of hearts had learned more to hate, than to be kind. God knows the human hearts he made with such care; and what happens when we choose not to believe Him. God IS love, and without His guidance, our world has only become more divided; more dangerous. Scientific Research | Honest to God? Corrie might have wondered, how an honest study of the precision of our world could overlook that possibility? Is there anything on this “pale blue dot” that was not conceived, designed and constructed by some intellect? Shouldn’t scientific research sift all possibilities before coming to conclusions? How could such research dismiss the wisdom in that ancient Book that has endured for eons, outlasted civilizations, and been attested to by so many millions of changed lives? Is our planet Earth really just “a lonely speck of dust” in the universe? “In the beginning, God created the heavens and the Earth,”  the Bible tells us. And “The heavens declare the glory of God, and the firmament shows His handiwork.”  Are we not awed by all of it, even as Dr. Sagan was? I know from my own encounter with the Lord in 1984, that God does indeed “come to rescue us from ourselves.” I, and so many others have found victory over our broken lives, here on this grand and privileged planet! For all of Dr. Carl Sagan’s research into extraterrestrial matters, I’d like to think that, after all, he didn’t miss the main truth about this pixel we call home… Earth was purposely designed by a gracious God, to sustain life; specifically, human life, male and female, who were created in His image. Night after night in Ravensbrück concentration camp, Barracks 28, Corrie and Betsie ten Boom shared about God’s gifts and promises to us, from one precious small Bible. Only a sovereign, creator God could say that. Only God, through Jesus Christ—Y’shuah, the Messiah—did! The Voyager 1 space probe was launched from Earth, September 5, 1977, forty years ago. NASA will continue for another ten years to monitor its journey through space, traveling at 38,610 mph. So incredibly immeasurable is God’s universe that scientists calculate it would take another 70,000 years for V-1 to reach Alpha Centauri, the nearest star other than our sun. That’s a distance of approximately 4.3 light years, or about 25 trillion miles from Earth. Wondrously, it only takes a moment, right here on Earth, to eternally connect with our Creator God, by faith in His Son, Jesus Christ. Sadly, Voyager’s recorded message did not include any hope-inspiring passages from the Bible, or any other faith-based writings and majestic hymns of faith. Will Voyager 1 just continue moving through the darkness of space, where only God is likely to hear its lonely message? Perhaps the Lord would receive the message as a desperate call for Help, a prayer even, to that “something incredible that is waiting to be known.” God answers prayer! By now, Dr. Carl Sagan knows that the Answer to all his research was right there, all around him. He knows that only an almighty God could create so unfathomably vast a universe with such precision and beauty. That only man’s poor choices made any of it ugly. 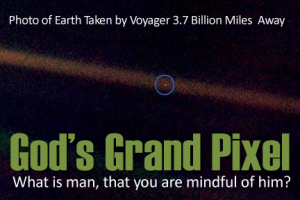 By now, he knows that God so loved him personally, and us, that he placed us on one perfect “pale blue dot” in the immense space of His love and grace, that we might find Him and believe. He’s waiting to be known by every soul on planet Earth. Much more than that, Earth is where God’s Love took the punishment for all our sins, our human failings, on a rugged cross—past, present and future—that believing His sacrifice for us, we might share in His eternal home forever. For each of us, it begins with faith, here on this perfect, privileged, grand pixel in space—our Earthly home.